Beautifully engraved certificate from the Wilmington & Chester Traction Company issued in 1898. 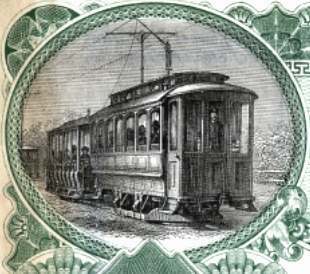 This historic document was printed by the American Bank Note Company and has an ornate border around it with a vignette of an approaching train with people on the inside. This item is hand signed by the Company's President and Treasurer and is over 106 years old. In 1895, the Philadelphia & West Chester Traction Co. was incorporated, and acquired control of the Philadelphia & West Chester Turnpike Road Co., and the Philadelphia Castle Rock & West Chester Railway, which in that year opened a steam dummy line. In 1896 the line was electrified, and in 1899 was completed between Philadelphia and West Chester. In 1894, the Chester Traction Co. was incorporated, controlling four area street railway companies. 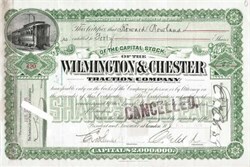 forming In 1910, the Wilmington & Philadelphia Traction Co. was incorporated in neighboring Delaware, with a subsidiary Southern Pennsylvania Traction Co. to lease these and additional companies within Pennsylvania. Wilmington & Philadelphia Traction Co. was renamed Delaware Electric Power Co. in 1927, and Delaware Coach Co. in 1941.